Valvular heart disease is the term used for any abnormality that exists with any of the heart's valves. Within the heart there are four valves which function in such a way to allow blood to move between the heart's four chambers in a specific, orderly manner resulting in efficient, normal heart function. 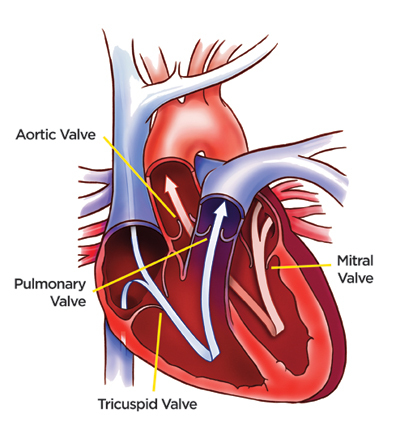 The four valves are: The aortic valve, the mitral valve, the pulmonary valve and the tricuspid valve. They can be faulty either due to insufficient opening or tightness (stenosis) or due to incomplete closure resulting in a leak in the wrong direction (regurgitation). The fault can be present form birth (congenital) or can be acquired later in life as a result of aging, infection, heart attack and occasionally due to other diseases or even trauma. The most common valve problem is aortic stenosis i.e. the aortic valve does not open fully to allow blood to escape the heart freely and reach all of the body's tissues. This can result in breathlessness, chest pains (angina), or fainting (syncope). Other common valve problems include aortic and mitral regurgitation i.e. the valves do not shut properly and allow blood being pumped in the wrong direction between heart chambers. Mitral stenosis is becoming increasingly less common in western societies due to the widespread use of antibiotics and resulting prevention of rheumatic fever which is the commonest cause of this valve abnormality. A tricuspid valve abnormality is fairly rare on its own, but tricuspid regurgitation is a common occurrence as a result of another valve abnormality or sometimes as a result of a lung problem. Valvular heart disease can easily be detected most of the times with an echocardiogram (ultrasound test of the heart) and appropriate management can then be offered.